Replay of Cox Automotive Q1 Auto Sales Call Available - Cox Automotive Inc.
A replay of the Cox Automotive Q1 Auto Sales Call hosted by Cox Automotive Chief Economist Jonathan Smoke is available below. 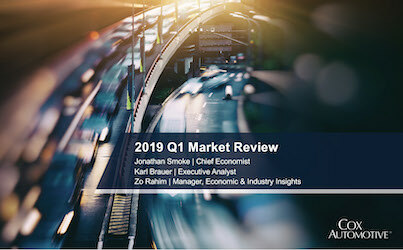 Along with Smoke, Cox Automotive Executive Analyst Karl Brauer and Zo Rahim, manager of economics and industry insights for Cox Automotive, presented a comprehensive look at the auto market in Q1 2019, including their perspectives on how the quarter will end. During the call, Jonathan and Zo presented the economic realities that are impacting the auto market in the first quarter. Karl looked at the few brands that are up so far in 2019 and discussed why they are bucking the downward trend.